A year ago, you had a chance to meet Resco at French Touch Dreamin for the first time. We participated at the 2017’ edition as silver sponsors. A lot has changed since then. For Salesforce and for Resco. During this last two years, we have participated in more than 20 Salesforce world tours and local community-led conferences. However, offering business mobility for Salesforce products is not our only mission. Business mobility is more than “some new and second-rate topic companies should deal with”. A huge potential that lies in Salesforce for field users deserves more attention that it’s getting. The aim of Resco and its mobility gurus that have 10+years of experience with enterprise mobile solutions, is for people to start talking. Salesforce customers, partners, solutions engineers, consultants…everyone now knows that running business operations on-the-go shouldn’t slow down daily productivity – it’s the exact opposite. With 50% of the global workforce going mobile by 2020 (acc. to Marketwatch) and with Salesforce being a #1 CRM provider, the question of mobilizing options for Salesforce is in place. 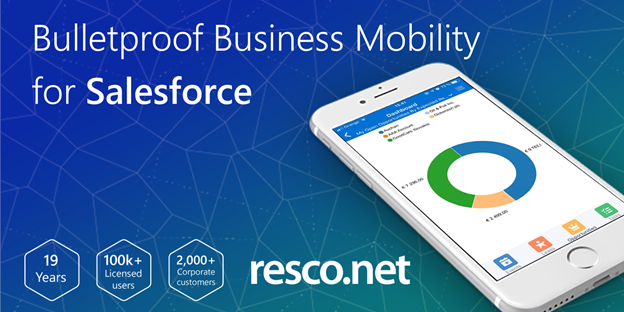 Resco’s mobile app is fully integrated with Salesforce – even with the most basic license, available to everyone, no matter the use case, nor industry. Secondly, we need to talk about offline. Because, even in countries like France, where the internet connection is almost never an issue, offline is important. Users sometimes prefer working offline to online, simply, because it’s faster. Then, think about the places like garages, planes, elevators, etc. The ability to access and manage Salesforce data fully offline is, indeed, a big topic. And at Resco, we love talking about it, we love collecting feedback. Where does your company stand with mobility, where do you think the future is headed? This is why we travel around the world. Getting closer to fellow Trailblazers and seeing that Resco and Salesforce are on the same page, sharing the same goal – a customer success. Resco is now among incredible platinum sponsors of French Touch Dreamin. Looking forward to see you at a DemoJam, at our booth, or during a lunch break! Let’s uncover the potential of mobilizing together. Talk to us via e-mail too: [email protected].